I started training back in March of 2010 in Soltela for my first shuttle flight. Many questions were asked, and many incredibly helpful voices rang out in reply. I was of course directed to the wiki, but as I started my career on the app, it was not always the easiest to switch to while in game. Although fellow pilots from all factions helped with any question I could come up with, I felt drawn to the Academy, due to it's existence solely to help new pilots. I felt it gave me a place to learn my way, and get to know the game, the factions and the people better. I quickly became an honor student within the Academy due to my willingness to help other new pilots with information, or even fuel runs in my shuttle and eventually explorator, even though I was new myself. 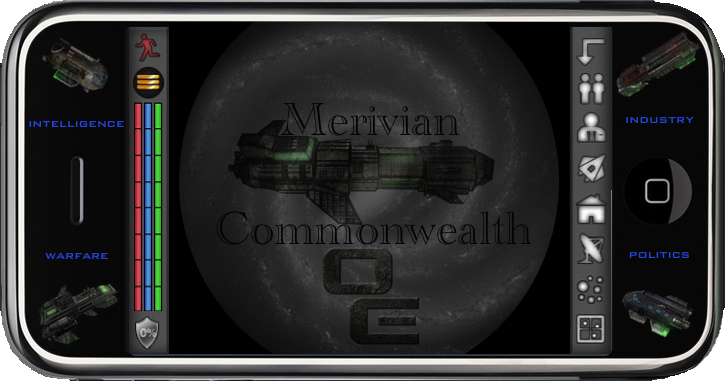 I learned quickly and fell more in love with the game, graduating from the Academy, subscribing and soon after being offered a home with a small faction in Q4 and a member of the Merivian Commonwealth, the N.U.M. From there, I began building my empire, quickly working my way up the ranks in the game, and within my faction. I helped expand our faction ranks, territory and public standing. I am now a high ranking member of the N.U.M and a member on the CW Council. My goal for Outer Empires is to become a place everyone can come to escape real life, an enjoyable place to play, communicate and advance their character. Although we are all different and each faction has it's own goals and agenda, we should come together as a Galaxy to support new players. In addition to having a welcoming community to interact with, we need the technology available to make Outer Empires the best it can be. Not only will these projects create excitement and add an element of unpredictability, but it will surely help with the new player experience and retention. Let's face it, we've all been new players, and without them, our community will never grow to it's full potential. That's why I publicly promoted the Academy during discussions before the final council vote on the official sanction of the Academy, which then passed. I also support this cause by keeping the newbie and 911 channels open to help out when possible. During the last Galactic War, we saw a very ugly scenario play out on many fronts. Factions were drawn together, and others divided. Enemies became friends, friends became enemies. Casualties were great and the wounds left behind are still healing. I'm proud to say that in the face of many willing to give up the game altogether, some bitterly opposed to me speaking at all, and with the help of fellow pilots, I sacrificed much needed sleep to speak in the open with members of the opposing faction and pushed both sides forward toward a ceasefire agreement, that eventually became the state of peace that we can all enjoy now. I commend those that showed they had their own voice and wanted the hostilities to end, and those that made it happen. While the last council was in session, there were faction issues that seeped into Council Chambers, and various other personal issues that reduced the council numbers to three by the end. In public discussion, I condemned these actions and joined the call for council reform and pushed for what became an "Oath of Office" for the council. I believe as we are a voice of the people, the public should fully have a say in all council matters. That's why we're asking you to vote for us in the first place, to be your voice, not to satisfy our own agendas on our private soap box. I will weigh the comments and concerns of all of you when making my decisions on the council. I've come a long way since my beginnings in this Galaxy we call home, and with your support I will strive to work for the best possible future for all of Nyridia, whether you're independent, in a large faction, or a small one, so all can enjoy the game as I have, and become as successful as they wish to be. Good luck to you all, and fly safe!